Where to have breakfast early morning in Pune? Amruteshwar Bhawan! We started from Pune towards Pandharpur early in the morning at around 6 and the question on everyone’s mind was where could we have breakfast at this unearthly hour before moving forward? Hungry and craving for breakfast, we turned to google for help but all the restaurants that came up were still to open for the day. Except, of course, for Amruteshwar Bhawan - our saviour for the morning. Amruteshwar Bhawan in Pune, the place to go for an early morning breakfast! 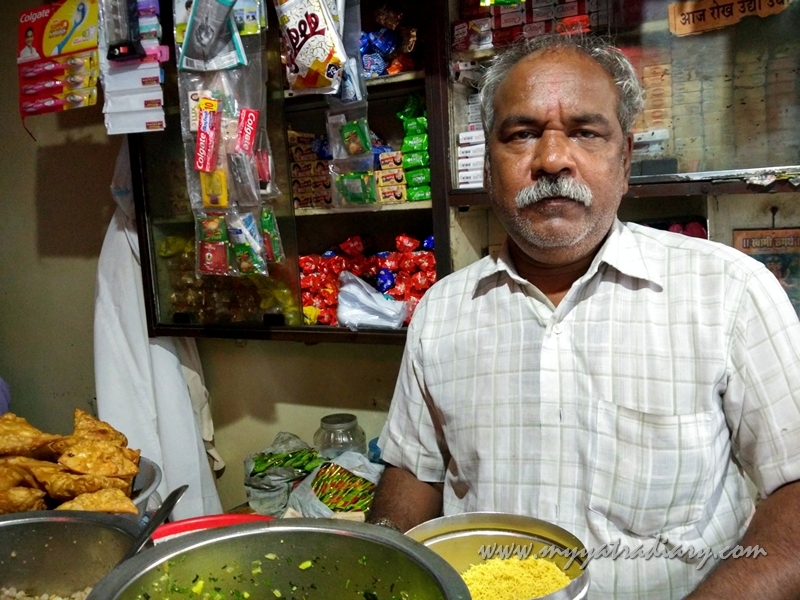 Amruteshwar is a one of its kind small eating joint serving breakfast for students and locals alike in the wee hours of the morning – a saviour for travellers like us and a haven for students starved for home cooked food. 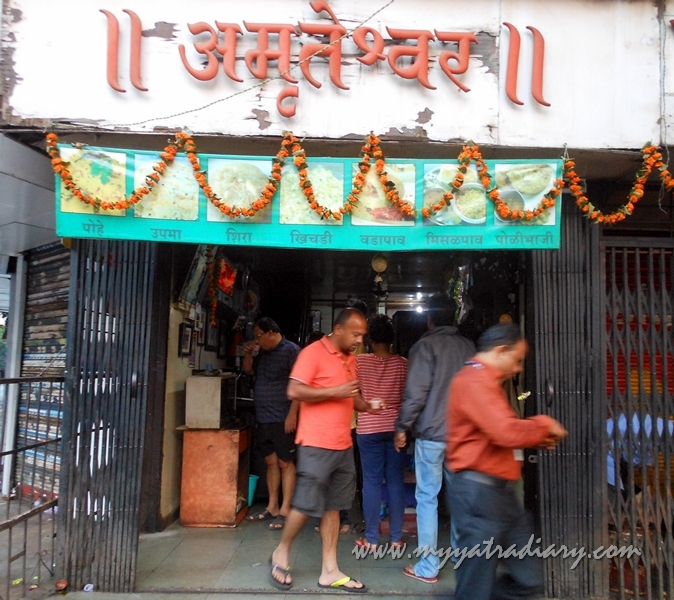 A small hole in the wall shop, Amruteshwar opens as early as 3 in the morning and runs all the day till 11. 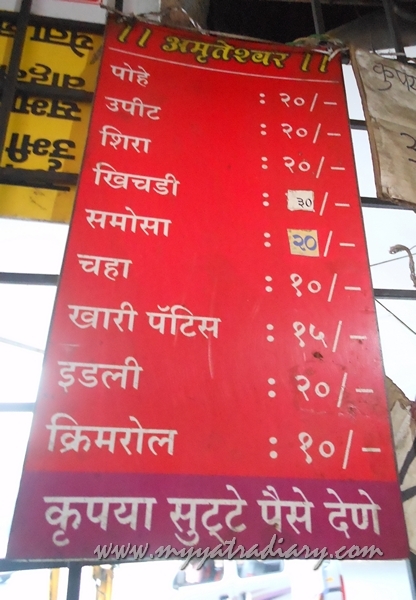 Amruteshwar Bhawan Menu: Take your pick! 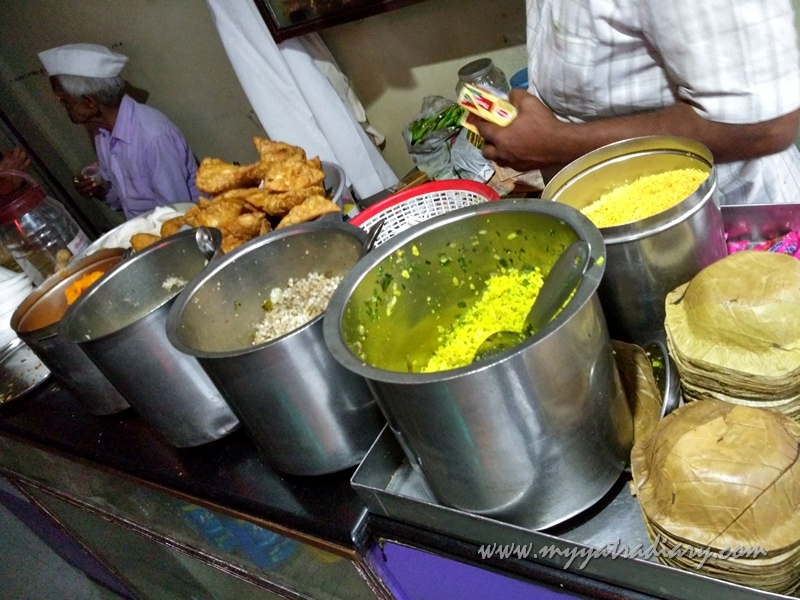 At Amruteshwar, you can get Puneri Maharashtrian style breakfast like Pohe, Vada Pao, Misal Usal Pao, Sabudana Khichdi, Shira, Idli, Khari Pattice, Nimbu Paani etc. The mention of so many dishes including Pohe and Misal bought water in our mouths and we didn’t need any more reasons to convince ourselves and take a turn over to Amruteshwar. Puneri breakfast on a platter: What will you have? The fact that locals start queuing up as early as 3 AM when the shop opens speaks of the legacy the shop has built for itself. It’s a standing eating joint and though the cleanliness standards and the ambience are questionable at first sight, I still loved the place for taste of the dishes. We had a plate of Pohe with sambhar, Samosa and a plate of Misal Pao. All of them were fabulous for a quick morning snack. The tea was pretty good too. The prices are very reasonable as well keeping in mind the student base which form a major chunk of the customers here. Rice flakes - Pohe with Sev; sorry for the blurry image... had butter fingers. 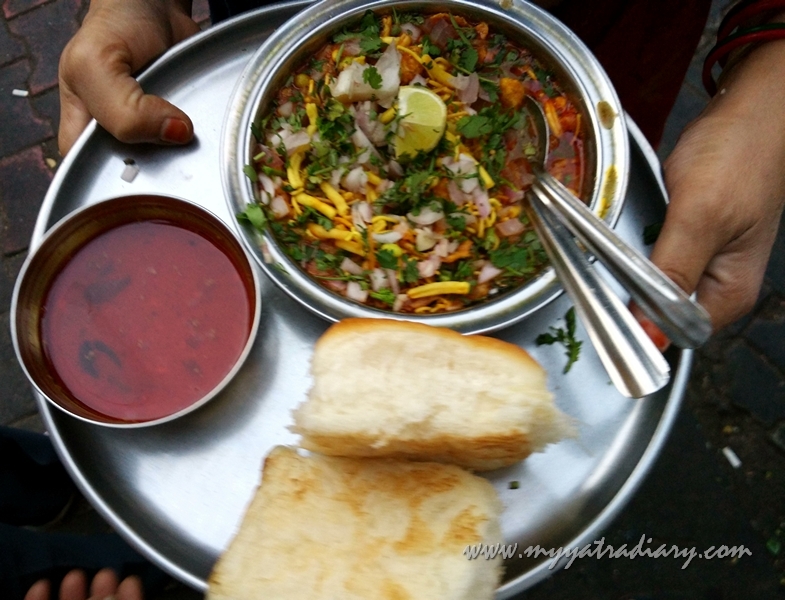 Potato-chiwda mix topped with lemon and coriander - dig into the spicy Misal Pao! If you are searching for a good place to have breakfast in Pune very early in the morning, don’t think twice - this is the place to go! And after you are done eating, don't forget to buy a plate for pohe for these lovely little creatures as well, you will get a packet of happiness and blessings for your way forward. 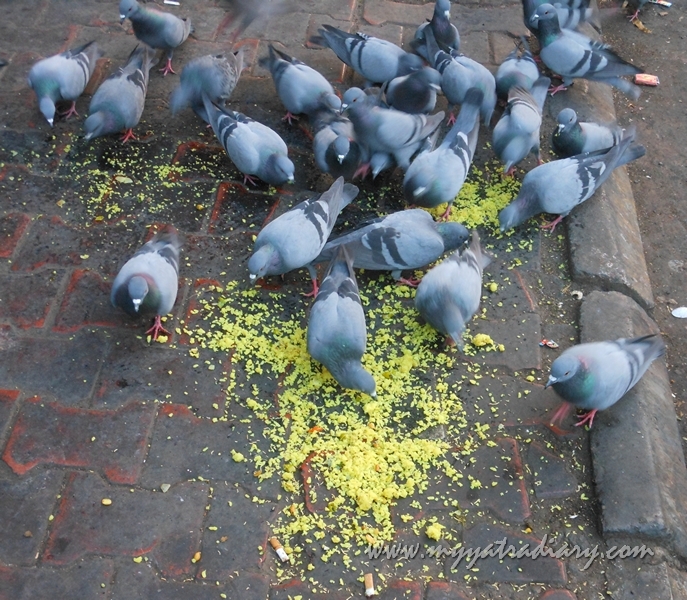 Pigeons having a feast at Amruteshwar's! Take the Lane No. 5 on Maharshi Karve Road. You will come across Amruteshwar Bhawan as a small hole in the wall shop. Hours: 3 AM – 11 AM. 1. Pandharpur Yatra: Weekend Getaway From Mumbai. 2. Rooted in Simplicity: Shree Kasba Ganpati Temple, Pune's Gram Daivait. 3. Places to Visit in Pune: Exploring the Historic (And Haunted?) Shaniwar Wada! 4. Great Pune Vegetarian Restaurants for Lunch / Fast Food: Vaishali and F.C. Chaat House. 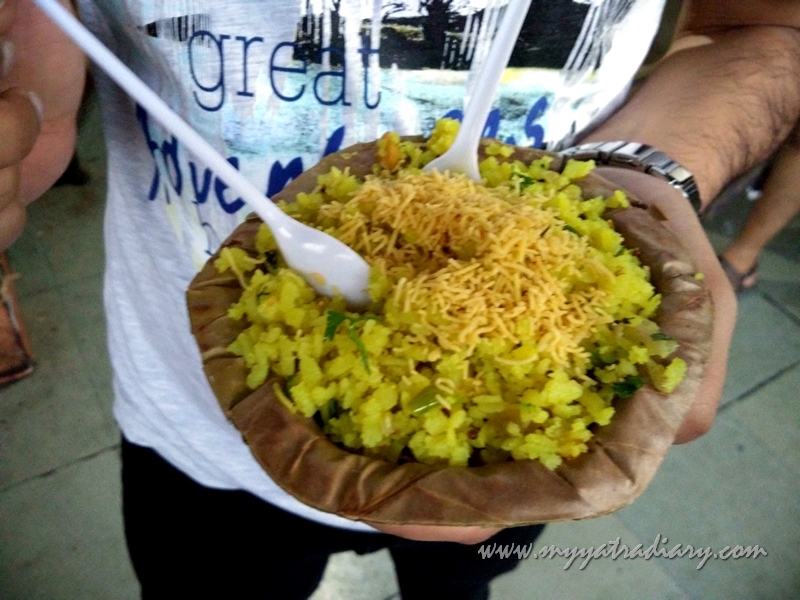 Pune is a heaven for eating and more so the dishes you mentioned. Have lived in Pune so it always evokes nostalgia, Arti! Very nice and tasty presentation with excellent photos. Interesting, never been to Pune, will check out whenever we visit here. 9 Reasons to Plan Your Next Trip to Bangalore.